Email jessie@handsonsandiego.org if you are interested in leading a project(s) listed or would like more information on becoming a Team Leader. Canine Companions for Independence needs help cleaning their vans and around their campus to ensure a positive and clean environment for their graduate teams and dogs. Volunteers will be cleaning the vans used to transport their dogs for training. This will include sanitizing and vacuuming the crates in the vans. Other activities may include cleaning the dog crates, light gardening and clean up around the campus. Project Requirements & Important Notes Attire: Closed toe shoes and comfortable attire Bring: A reusable water bottle, sunscreen, and a hat. Note: There will be no direct contact with the service animals. About Canine Companions for Independence Canine Companions for Independence is a non-profit organization that enhances the lives of people with disabilities by providing highly trained assistance dogs at no charge to the recipient. Be a mentor to 1-4 teen/young adults with special needs, such as autism, while they learn to play music. 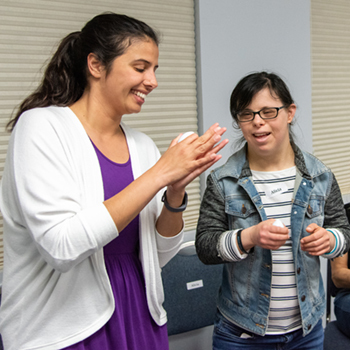 Volunteer mentors provide encouragement, model expected group behaviors, give compliments, give directions, and help their mentees build friendships and practice social skills. Mentors are important because they help the students with special needs gain social skills (e.g. learning how to make eye contact, have a conversation, have self control, etc.) that are essential to living a meaningful life in their community. No matter your level of musical experience, you'll have a great time shaking a shaker, playing a drum, signing along and much more. Before and after the group, volunteers assist with set up (unloading musical equipment, setting up chairs, music stands, music books, etc. ), process with the volunteer team after (complete a journal entry about experience and rate mentee responses), and tear down (load equipment). Project Requirements & Important Notes Physical Ability: Ability to lift and move musical equipment, chairs, etc. (They are able to accommodate weight restrictions) Note: We need volunteers with a great attitude, who are patient and comfortable working with their mentees one-on-one. About Banding Together Founded in 2009, Banding Together’s mission is to bring music opportunities to individuals with special needs in our community. 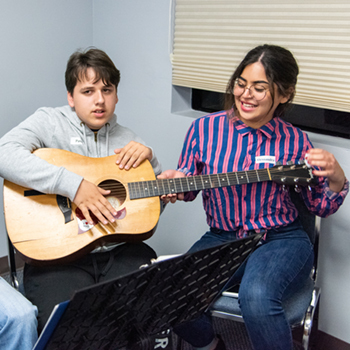 This is accomplished through key objectives that include providing: music therapy scholarships, free Jam Session programs, mentorships, and instruments. Help run the Solana Center's Food Cycle Program, turning food waste into a high-quality soil supplement, and closing the loop of organic waste! Volunteers help process and tabulate incoming organic material, maintain compost piles, and prep buckets to be returned to program members for more collection. This project is great for those that are not sensitive to the "ick" factor and want to get VERY hands on with waste reduction! The Food Cycle Program is a co-op where San Diego County residents and small businesses preserve their organic waste using the Bokashi method and then deliver it to Solana Center to be turned into a nutritious soil amendment that is distributed back into the community. This process reduces tons of waste sent to the landfill, reduces methane pollution, and creates a healthy soil supplement for San Diego gardens! Project Requirements & Important Notes Attire: Wear closed-toe shoes and clothing that can get VERY dirty. Physical Ability: This activity can be quite physically intensive and pretty messy! Must be able to wield a pitchfork, push a wheel borrow, and lift buckets of up to 30 lbs. Some accommodations can be made, please ask. About the Solana Center for Environmental Innovation ​Solana Center for Environmental Innovation is a San Diego-based 501(c)(3) nonprofit organization that focuses on Zero Waste, composting, and water conservation. They mobilize the local community through innovative outreach and provide consulting services to businesses and jurisdictions in order to address the region’s most pressing environmental issues and enact impactful change. Activities will depend on what is happening at the farm seasonally and include prepping garden beds, harvesting produce, weeding, trimming shrubs, planting seeds, mulching, sorting seeds, watering plants, and installing irrigation. 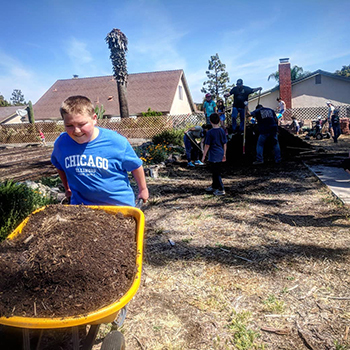 There are often build projects as well such as building garden beds, seedling tables, shaded awnings, creating community spaces, and much more. This is a great opportunity to be at the forefront of a locally grown, organic food movement that provides for food-insecure members of our community. Project Requirements & Important Notes Attire: Be prepared to work outside. You must wear closed toe shoes. Dress in layers in weather appropriate attire that can get dirty. Bring: Water bottle with plenty of water - there is no drinking fountain on site. They will supply gloves, tools, sunscreen, and materials, but feel free to bring your own favorite tools or gloves as long as you understand you are responsible for keeping track of them. Physical Ability: They have a variety of activities for all skills and abilities. Please notify Bianca (volunteer@plantspeoplecommunity.org) if you may have specific needs and would like to make sure there are projects you can engage in. Waiver: Every volunteer is required to sign a waiver. Anyone under 18 must have waiver signed by a parent/legal guardian. Please also sign waivers for very young children attending with parents. Sign waiver here. ​Weather: Light rain will not cancel event. In the case of inclement weather, volunteers will be alerted via e-mail. About Botanical Community Development Initiatives Botanical Community Development Initiatives (BCDI) is working to improve lives by connect plants, people, and community. Community Roots Farm is a project of BCDI and is 1-acre urban farm located in an Oceanside neighborhood and grows food with community, for community. The sustainably-grown produce is served in meals to children in local state-funded preschools that are located in low socioeconomic neighborhoods where access to fresh food is lacking. 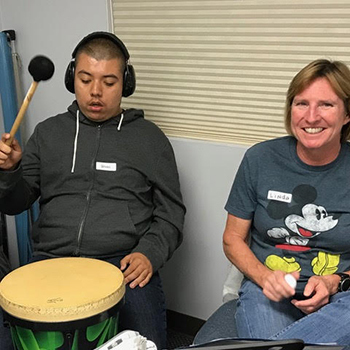 Offered for adults with intellectual and developmental disabilities, the Our Place Wellness Program expands on offerings of adaptive yoga, fitness and Zumba classes to include music & art therapies and nutrition training. All classes are led by certified professionals. As a volunteer, you will assist these instructors to ensure all students are having a fun and safe time! We need volunteers with a great attitude, who are patient and comfortable working with their students one-on-one. Project Requirements & Important Notes Attire: Wear workout friendly attire with closed-toe shoes. Bring: Reusable water bottle. About The Arc of San Diego The Arc of San Diego supports and empowers people with disabilities to achieve their life goals. 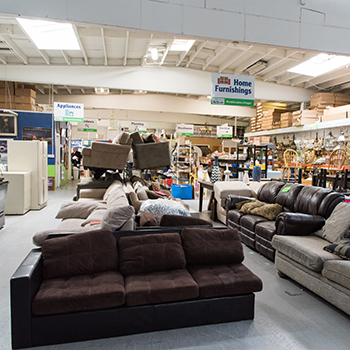 The ReStore offers many volunteer opportunities for individuals who are able to help in a variety of roles and for any length of time. 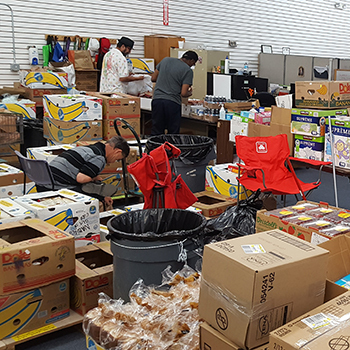 Duties include sorting donations, organizing inventory, stocking shelves, helping customers, light construction, or finding creative ways to use donated products. They'll find the task that is perfect for you! You will be given a brief orientation, tour and tasks/projects to work on. Please arrive on time. You are welcome to work past your shift if you are able and willing to do so. Project Requirements & Important Notes Signing up: ALL VOLUNTEERS will also need to sign up through San Diego Habitat’s online system in addition to the HandsOn system. This helps them track volunteer hours to report for grants and also allows them to track their waivers. To do this, go to http://vhub.at/handsonsd. Court-Ordered Volunteers: San Diego Habitat for Humanity accepts, on a limited basis, volunteers who are required by a court to complete community service hours. They cannot accept volunteers who have a past or current conviction of a violent or menacing nature, conviction of an offense of a sexual nature, or conviction of theft or burglary. 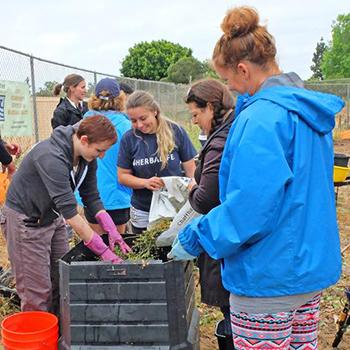 Minors: Volunteers aged 14-17 must have a San Diego Habitat waiver signed by a parent/guardian. Volunteers aged 14-15 must be accompanied by a parent or guardian for the duration of the volunteer shift. Bring: Plenty of water and a sack lunch or snacks. About San Diego Habitat for Humanity The San Diego Habitat for Humanity ReStores are home improvement discount stores with a simple premise: by selling new and gently used donated goods, we can fund the construction of new Habitat homes in San Diego County. Help serve the 150 or so men, women, and children living in the building in a year-long recovery program. You will be serving food, not cooking, or cleaning up. 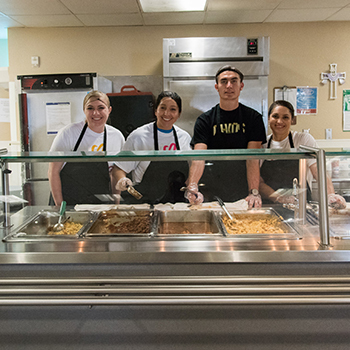 Volunteers serve hot meals, salad, bread, and dessert. 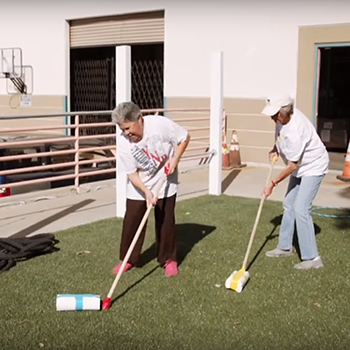 The residents at the San Diego Rescue Mission are participating in 12-month long programs to transform their lives and work toward self-sufficiency. Project Requirements & Important Information Attire: Dress in pants, no sleeveless outfits and closed toe shoes are a must! Tying up long hair is recommended, volunteers will be provided with a hairnet. Religious Observance: Any prayer or religious observance during the project is optional, volunteers are welcome to opt out. Note: Photos of clients are not allowed. The San Diego Rescue Mission cannot accept donations of home baked treats/outside food. This project may end early depending on the number of residents who attend the meal service. About the San Diego Rescue Mission San Diego Rescue Mission is a non-profit homeless shelter and recovery center serving thousands of homeless, hungry, and low income men, women, and children in San Diego since 1955. Catholic Charities Vista Food Resource Center needs help with a food delivery on the 3rd Wednesday of each month. Working together to enhance the dignity, equity, and impact of the emergency food assistance network. Volunteers for this project will help the Food Resource Center team prepare for the distribution of USDA commodities. Project Requirements & Important Notes Attire: This is an indoor and outdoor event in the North County Inland region, so make sure to wear comfortable, weather-appropriate clothes, a hat, and must wear closed-toe shoes. Bring: Sunscreen and plenty of water. Physical Ability: Most volunteers will need to be able to stand for 2 hours, bend, and lift 15-25 lbs repeatedly. 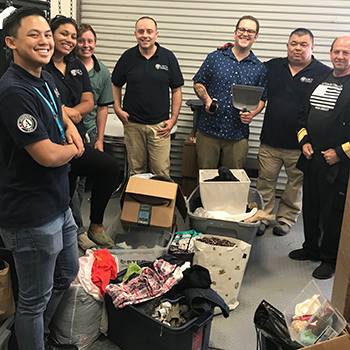 About Catholic Charities, Diocese of San Diego Catholic Charities Diocese of San Diego is a ministry of the local church based on the person of Jesus, dedicated to caring for the poor, the vulnerable and the marginalized. Be a part of growing an urban forest in local disadvantaged communities! CAL FIRE, the State Forestry Department, gave Tree San Diego a grant to plant trees. 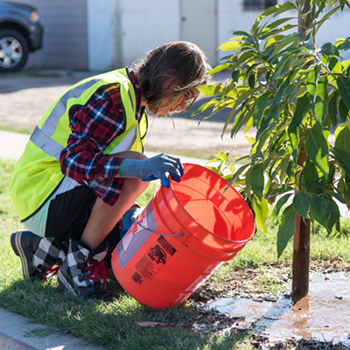 They planted 600 trees in disadvantaged communities in Logan Heights and northwest Chula Vista. These trees need to be watered once each week for the next three years. This care is necessary to ensure that the the recently planted trees grow into a beautiful, mature urban forest, which will provide the communities with many health, environmental and economic benefits. Volunteers will carry buckets of water from a truck to pour on the trees. There may also be some weeding of the tree basins. Project Requirements & Important Notes Attire: Must wear closed toed shoes. Bring water, hat and sunscreen if desired. Physical Ability: Must be able to walk two miles over two hours and able to lift and carry a 16 pound bucket. Children are welcome but please remember the walking involved and the need to step into the street to fill the bucket. Weather: This project is subject to cancellation after heavy rain to prevent overwatering the trees. Note: Please be on time (not more than 10 minutes late) to the meeting location. Volunteers will be walking or driving down different streets and do not return to the meeting spot until the end of the volunteer event. There is no immediate access to bathroom facilities. About Tree San Diego Tree San Diego works to benefit the greater San Diego region by helping provide a healthier place to live, work and play. TreeSD’s mission is to significantly impact the quantity of quality urban forest in San Diego County and beyond. Quantity means increasing the percentage of urban forest. Quality means the right trees, in the right places, properly maintained. 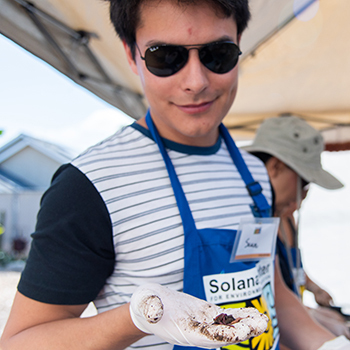 The Solana Center's resident worms help them teach San Diegans about the beauty of Vermicomposting (composting with worms). They act as a demonstration site and nursery for raising and distributing worms to homes around the County. Help care for these amazing compost critters and promote sustainability in our community! Volunteers help care for their worm nursery and demonstration site by separating worms from worm castings, feeding worms, and building new worm beds. This activity is great for kids! Project Requirements & Important Notes Attire: Closed-toe shoes and clothes that can get dirty. ​Physical Ability: Not afraid of worms! Accommodations can be made for all other physical needs, just let the leader know. ​Weather: Not canceled for light rain. If heavy storms are in forecast you will be notified of cancellation by email and phone the night before (by 5pm). For not predicted heavy storms, cancellations will be notified ASAP. About the Solana Center for Environmental Innovation ​Solana Center for Environmental Innovation is a San Diego-based 501(c)(3) nonprofit organization that focuses on Zero Waste, composting, and water conservation. They mobilize the local community through innovative outreach and provide consulting services to businesses and jurisdictions in order to address the region’s most pressing environmental issues and enact impactful change.